After UN envoy to Libya, Ghassan Salame, proposed his plan on the solution to the crisis in Libya through the establishment of an executive power and the postponement of other issues, the plan was approved by HoR, but the Supreme Council of State had accepted the plan conditionally on finding a mechanism of shared voting on the selection of the Presidential Council. 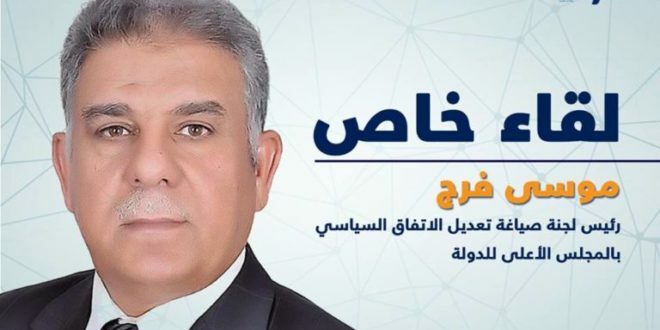 Arraed LG conducted a private interview with the Chairman of the Drafting Committee for the amendment of the Political Agreement of the Supreme Council of State, Musa Faraj, to find out the latest developments. A new plan of action was submitted by the UN envoy Ghassan Salame to resolve the crisis in Libya, however the Supreme Council of State issued a statement rejecting this plan. Some members welcomed the plan with the requirement of achieving a partnership and balance in the selection of the executive authority. What do you think of the plan and what has caused the dispute ? Response: The UN envoy to Libya, Ghassan Salame, did not present a new plan, but presented a proposal on the executive authority, which is related to the presidential council and the government. The Supreme State Council issued a statement on November 15 welcoming the proposal, however, Salame objected to the partial mechanism for the selection of the members of the Presidential Council, and called for correcting this mechanism until a Presidential Council is chosen to ensure that the political process will proceed towards the permanent stage is reached through presidential and legislative elections. ArraedLG: You mentioned in previous meetings that your objection to the article was that it gives the HoR solely responsibility to vote on the Presidential Council, what is the reason for this objection? Do you have any other observations or objections? Response: As mentioned, the Libyan political agreement signed in the city of Skhirat at the end of December of 2015 stipulated three higher institutions of the state arising out of the political agreement and derive its legitimacy from it – the Supreme Council of the State, the House of Representatives, the Presidential Council from which the GNA emerges. The conflict that called for dialogue and political agreement was between the former National Congress (the Supreme Council of the State) and the Council of Representatives. The idea of ​​establishing a consensual executive authority was represented by the two parties so that the political decision was not limited to one party. The Supreme Council of State and the HoR, are both required to agree to any constitutional amendment, and any amendment to Annex No. 1 on the nomination of the members of the Presidential Council. The proposal submitted by the UN envoy ignored this rule, and gave the HoR the right to monopolize the members of the Presidential Council, in conflict with the Political agreement and violates the principle of consensus and partnership on which the agreement was based. There was no statement of rejection of Salame’s plan of action. The statement spoke about the amendments of the text concerning the executive authority in the proposal. The statement expressed a surprise of the mechanism of choosing the presidential council, and to uphold the principle of consensus and partnership at this stage that cannot be subjected to one political party making decisions decision in Libya. ArreadLG: Yesterday the UN envoy said that the elections will be held in 2018 even if there was consensus on the executive authority. Do you support this, and do you see that the elections will be a viable solution to the crisis in Libya? Response: The elections are the main objective of the political agreement. The elections are in accordance with the constitution, which ends the transitional stages. The permanent phase begins with the election of a head of state and a legislative authority in accordance with the constitutional provisions, and we seek this and hope that this will be achieved as soon as possible. The principle of consensus and partnership in the remainder of this transitional phase is what will enhance confidence between the parties and create a positive atmosphere and support the chances of achieving the constitutional entitlement and then the general elections, which we hope to take place in 2018. ArraedLG: Our focus is on a Libyan dialogue under the guidance of the United Nations.” Many initiatives parallel to the work of the UN mission to solve the crisis in Libya are active, such as the ‘comprehensive vision’ supported by the head of HoR, and the movement by the African Union. How do you view these initiatives? Response: In principle, we welcome all efforts that have been made and are being made to contribute to bringing together views and supporting consensus to overcome the current stage, but now we have reached a stage in which we can not afford to waste more time and distract efforts. It is better to focus on a Libyan solution with the UN. International support will ensure the implementation of the obligations of the different parties. ArraedLG: “Libya is not the source of illegal immigration and destination and the US’s concerns must shoulder their responsibilities in this regard.” There have been extensive condemnations of human trafficking in Libya after the report of CNN America. What is the credibility of this report? How do you see the solution to the crisis of illegal immigration from Libya playing out? Response: I do not think that the CNN report has credibility and there are press reports and statements from countries that have questioned its credibility, but this does not negate the hypothesis of violations of illegal migrants across the border, whether on Libyan territory or in the territory of the source. We therefore support the announcement by the Government of National Reconciliation that the competent authorities have initiated investigations to identify any violations that may have been committed on Libyan territory and bring the perpetrators to justice. The Libyan people can not accept the existence of markets to sell people on their territory. This behavior is contrary to the values ​​and customs that the Libyan people believe in and the social order in Libya that has been established for centuries. The issue of illegal immigrants is a problem for Libya on the security, health and social level. It is not fair that Libya alone bears this burden. Libya is not the source, nor is it the destination, and the countries concerned must shoulder their responsibilities in this regard. I believe that the solution to the illegal migration crisis must address a comprehensive treatment that begins by addressing the reasons why these people are leaving their home and risking their lives on a perilous journey. ArraedLG: Failure to engage the House of Representatives in the political agreement is the reason for the disruption of the completion of the Constitution.The Constitution Drafting Body completed the project last May, what are your observations on it, and when will your expectations be presented for the purpose? Response: The Constitution Drafting Assembly voted on the draft constitution on July 29, which is an elected and independent body and it can not be ignored. However, it seems that there are different objections to this draft. This particular mandate in the political agreement did not have the HOR full engagement and implementation of the provisions of the political agreement governing this matter. I believe that the subject needs to be addressed in accordance with the provisions of the political agreement.